Many of us have memories of our grandparents breaking the leaf of an aloe vera plant and using it to soothe a burn or scraped knee. 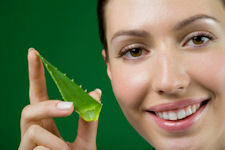 This is because the gel inside the leaf of the aloe vera plant has long been a natural healing salve. For centuries these plants have been used to help heal cuts, burns, and other skin problems so aloe vera skin care has a long, long history of effectiveness. Nowadays with the new popularity with everything natural and organic aloe vera has become one of the top ingredients in skincare products. All natural skincare has boomed in recent years. Today you can find moisturizers, creams, lotions, and supplements that contain aloe vera. The aloe vera gel is usually combined with other natural ingredients that help enhance its healing qualities. Aloe vera gel, when used with other natural ingredients can significantly increase the skins natural ability to replenish skin cells. When our skin cells die they need to be replaced with new skin cells in order to encourage healthy skin. This process helps to slow down the aging process and helps to keep the skin moisturized and young looking. By using skincare products containing aloe vera gels you can intensify this process. Aloe vera skincare products don’t just extend to beauty products. Considering the healing qualities of aloe vera it should be no surprise that it is included in many medical creams and gels. These creams and gels can be for itching, shingles, cuts, psoriasis, and burns. Aloe vera also has antiviral and antifungal properties. This allows aloe vera to heal cuts and burns while reducing the chances of getting an infection. Not only does it heal but it can be used as a natural type of anesthesia in order to reduce the pain associated with cuts and burns. It is also often used to soothe the burning sensation people get when badly sunburned. It is a good idea to purchase and grow your own aloe vera plant as getting it directly from the plant is the best way to use it. If you don’t have your own plant aloe vera based skincare products are still a good option. When buying these products it is important to first read the ingredients. There shouldn’t be many ingredients added and the ingredients should always be natural. You should also look up the reasons that each ingredient was added. Shopping online is a great way to find products that are special to your skincare needs. For example if you have eczema then you can find a specific aloe vera product that addresses this skin problem. Aloe vera can be found in many skincare products. The uses for this gel include soothing cuts burns, and rashes. It also helps the skin to regenerate new skin cells. Aloe vera is no longer just a plant found in our grandparent’s house, it is a mainstream skincare ingredient found in many of the products we use everyday. I use the raw gel straight from the plant on cuts. I call it magic gel ! Joe, I use the straight gel, too. Just trim off a bit of leaf and squeeze it on the ailment. Simple and effective.